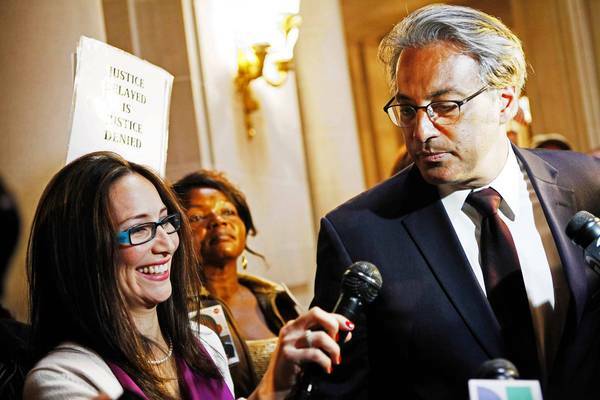 Suspended San Francisco Sheriff Ross Mirkarimi will return one last time in front of the city's Ethics Commission early Thursday when the commission will make a recommendation on whether he should be removed from office. Mirkarimi was suspended without pay by Mayor Ed Lee in March after he pleaded guilty to misdemeanor false imprisonment in connection with a Dec. 31 incident in which he grabbed and bruised his wife's arm during an argument. I do say that Mirkarimi should not have been prosecuted because no complaint was made by an interested party. He and his wife are adults. Whatever happened between them is their business, not the mayor's and not the public's. The liberal Democrats who control San Francisco are completely opposed to civil liberties. It is their policy to intervene is people's lives and try to ruin them, if they have some personal disapproval of their behavior. (AP) WASHINGTON - A man suspected of shooting and wounding a security guard in the lobby of a Christian lobbying group had been volunteering at a community center for gay, lesbian, bisexual and transgender people. The LGBT groups have disavowed such violence, but they are incredibly hostile, provocative, spiteful, hateful, and oppressive towards Christians. They do not respect free speech. I don't know how anyone can compare Mirkarimi to Polanski. That 13yo girl was raped. The Mirkarimi-Lopez incident was completely trivial, with no one being hurt and no one complaining. Mirkarimi, of course, could have spared the city a legal spectacle by quitting. He originally took a plea deal, accepting a misdemeanor charge of false imprisonment that originated from an argument with his wife while their child watched. The next stop before the supervisors will be the final act. It will take nine of 11 votes to dismiss Mirkarimi, a former supervisor and member of the board's progressive flank. ... It's time to remove a discredited figure. Mirkarimi should be dismissed. What? He pled guilty to the charge and then declined to cooperate with police? What did the police want? After the plea bargain, the criminal case was over and there was no reason to talk to the police. You can get a video of his story here. I don't know what more anyone wants to know. San Francisco politics is dominated by leftists, progressives, gays, lesbians, Jews, Greens, and other fringe groups. It is the most intolerant place on Earth. I have never heard of any other city doing anything like this. In my opinion, Ivory Madison should be disbarred for betraying an attorney-client privilege. Lopez went to her for a confidential legal opinion, and Madison used that info to make a police complaint detrimental to the wishes of Lopez. After 10 hours of emotional public testimony and difficult deliberation, the city Ethics Commission on Thursday found that Sheriff Ross Mirkarimi had engaged in official misconduct by inflicting "physical violence" on his wife during an argument and pleading guilty to falsely imprisoning her. But at the end of the day, his fate was no clearer. Mirkarimi is more than a third of the way through 52 weeks of domestic violence training mandated by his plea agreement. The most persuasive evidence in the case, many commissioners said, was a video depicting a tearful Lopez displaying a bruise on her arm, the result of the New Year's Eve argument with her husband. Still, much of the commentary and questioning Thursday revolved around exactly what constitutes domestic violence. "I believe that domestic violence is a serious offense and, as such, am glad that the allegations in this case were brought forth and taken seriously," said a Mirkarimi supporter named Danielle. "But I do not believe any serious offense was committed here." Another supporter said: "I can tell you about domestic violence. It's when I had an infant in my arm and my husband shoved me, not a little tug on the arm.... Some people bruise quickly and easily. That's no proof of violence." He was not convicted of domestic violence. The prevalence of domestic violence can be traced to the abuse of children. Specifically, that corporal punishment is allowed. Once you teach a child it is okay to be hit by a parent, hitting your wife becomes a logical extension. Anyone who believes it's okay to hit your child for "discpline" should have no problem with hitting your wife for the same lame reason. There will only be justice in the world when parents are arrested for hitting their children. That is the totalitarian world that the leftist-feminist-psychos are leading us to. But I still think grabbing another person's arm (unless in self defense) is a crime regardless. I do understand, as you've written, that marriages do have tension, but I do not believe it should extend to physical violence. If Mirkarimi can't follow the law he's sworn to uphold, how is he qualified to be the top cop in SF? And what singles out the crime of domestic violence to be able to be a private matter, unlike if Mirkarimi were a mob boss, drug dealer, or a crook in general? There's a reason why criminal trials are usually labeled "People v. Defendant": because whenever someone commits a crime, any crime, the crime is against the state not just the victim. All this said, while I believe that Mirkarimi deserved some punishment, I think the stay-away order for a misdemeanor was a bit much. It wasn't just that evil commie pinko SF left wing that was going after Mirkarimi; Melanie Morgan, the conservative co-host of the KSFO morning show, also called on Mirkarimi to step down. And while SF Chron columnist Debra Saunders condemned Mirkarimi's actions, Saunders concedes called the city's prosecution of Mirkarimi a witchhunt. Regarding the shooting at the FRC, there will always be politically motivated violence from all sides of the spectrum, like the Weather Underground and Symbionese Liberation Army and Ted Kaczynski from the left, then Tim McVeigh and the Sikh temple shooter and Knoxville Unitarian Universalist church shooting from the right. And it seems that in the modern era of hyper-polarized politics the left and right will be calling each other intolerant for years to come. For some reason the comment you reprinted here still is invisible on the original post. Still i thank you for reprinting it and responding and for providing a discussion opportunity for all sides, and I think I picked a bad example with Polanski but I would respectfully disagree with some of your response. You have a better analogy with the drug dealer. Libertarians have always complained about that being a victimless crime. But most crimes have a victim who makes a complaint. I just don't get how grabbing an arm is a crime. If you told me that Gandhi filed a criminal complaint about someone grabbing his arm, then I would have said that not even a pacifist extremist like him would have been so silly. The arm grab was such a trivial thing. Melanie Morgan is more feminist than I thought. Anonymous Barbara, if you read the story, you would have learned that grabbing the arm was prosecuted as a crime. However, "fear" is not going to enhance the charges. The criminal case is closed. Yes, my view is that it should not have been a crime. There is a plot to destroy their family.